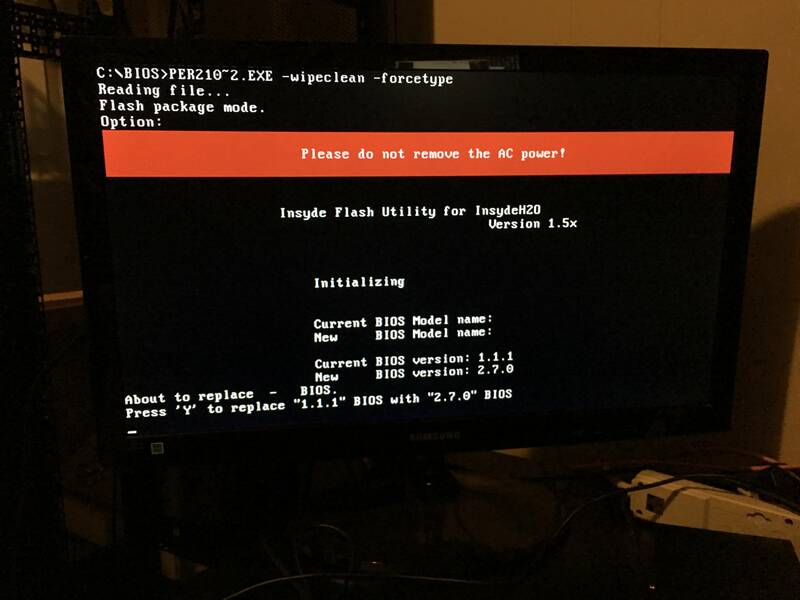 Flashing over OEM-R BIOS/Firmware on Dell hardware - Blah, Cloud. I found an incredible deal on some used Dell R710 servers, so I bought two to bring my collection of these beasts up to 3 so I can run VSAN, NSX, vCloud Director and some other SDDC tastiness (VMware VIO anyone?). Plenty of EMC only line items, still though, same motherboard, iDRAC, etc. So, powering it up, clearly had not been updated in some time (BIOS version 6.0.8, iDRAC6 1.10, Lifecycle Controller 1.2), so I did what any good sysadmin would and download the Dell CentOS Firmware LiveDVD (detail), stuck it on a USB and proceeded to pimp it out with all the latest firmwares. Updates stated they were successful, so I thought “yay!”, rebooted the host and hit F10 to log into Lifecycle Controller/Universal Server Configurator. Clearly, that’s not gone well. After a spot of Google archaeology I found some threads indicating that this may be because when 3rd Party Integrators use Dell items they are offered OEMR versions of the firmwares (OEM-Ready) we can find those for the R710 here. However, they are lagging behind and also handicap the functionality and integration somewhat, in that, they don’t play nice with stock firmware images for other components (hence my LCS/USC weirdness). I don’t want to have to flash a special OEMR BIOS every time I do an upgrade, I want to use the standard Dell repos with my OMSA integration for vCenter and/or Dell Repository Manager. So how can we force a “standard” Dell firmware on to the hardware (which is, of course, identical to its EMC/Google/whatever integrated counterpart)? Setting the file system to FAT32 and the bootable OS type to MS-DOS, then load our stock Dell Non-Packaged BIOS firmware .exe on to it. Let the upgrade complete, reboot and BAM, stock Dell goodness again. Pressed F10 LSC/USC loads right up with all the usual Dell branding and we can update our firmwares from here on out with peace of mind, knowing that we don’t have to wait on special OEMR firmware updates. Please help me Myles. 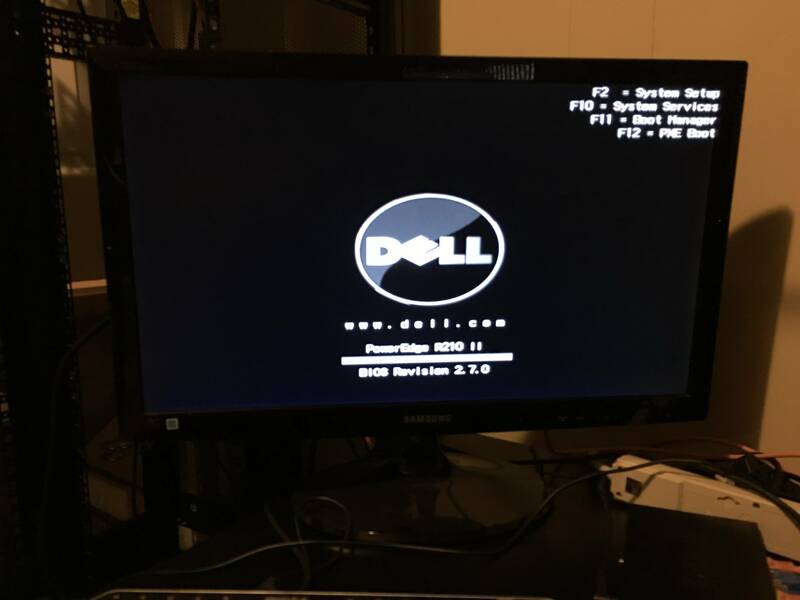 I just bought a Dell R210ii XL that apparently has an OEM BIOS. No Dell logo and it’s stuck on BIOS v1.1.1 from 2011. Been trying for days to update it to no avail. I am having trouble creating a MSDOS bootable usb drive. I don’t know if it’s the image that’s bad, or if my server is just being stubborn, but it won’t boot to it. 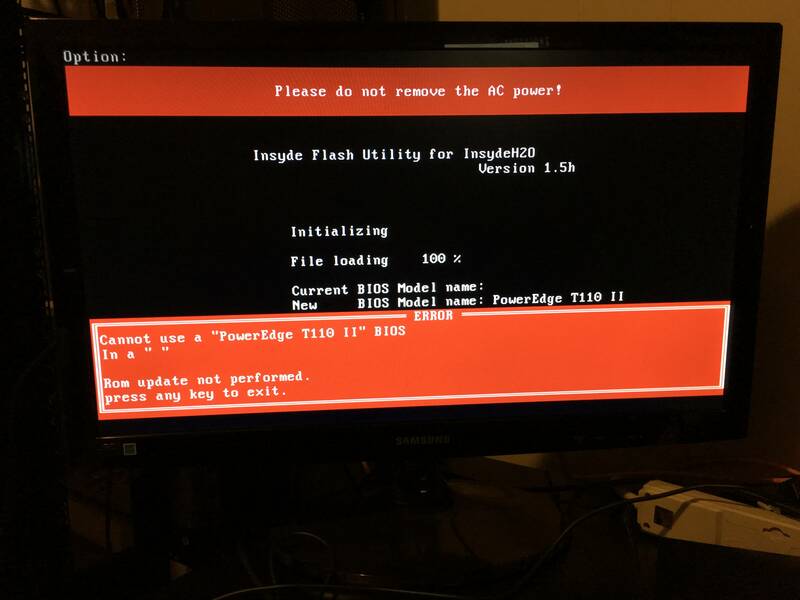 Give that a shot, and follow the instructions again, make sure when it boots you’re hitting F11 (if that is BIOS Boot Manager for your server) and select the USB as the boot drive (may show up as a HDD). I finally figured out how to boot to usb. This R210ii XL is a little different than I’m used to. I’m going to use Rufus 2.8 now to create a FreeDOS boot disk with MBR partition type, then copy a few Unpackaged BIOS files over and give this a shot. I’m nervous it’s not going to work. You make it sound way easier than it is. Wish me luck! I’ll report back shortly. Well, I got further this time, but it didn’t like the bios file I downloaded. Not sure why it says T110 II, since I have a Dell R210II XL. Service Tag is 2TWNW12. Do you mind taking a look and verify that am downloading the correct file? My BIOS is currently verion 1.1.1. I tried the 1.3.1 unpackaged BIOS file first (PER210II_010301.exe), then tried 2.7.0 (PER210II_020700.exe). Same result. There has to be a way to flash this dang thing back to Dell standard BIOS. Looks like I’m making progress. I tried using the command “PER210II020203.exe -wipeclean -forcetype” and now I see this screen. Think I’m going to cancel and make sure I have the correct BIOS version. I’m don’t want to brick my new server. Decided not to cancel and just go for it. Success! This was a lifesaver, thanks! Thank you so much! I’ve never heard of custom BIOS for dell servers but your /forcetype instruction did the trick. Does this work for DRAC recovery as well? i.e. Can I launch the “firmimg.d7” file in the same manner as the BIOS above? I need to try this on R610, I have dell branding, but old Lifecycle controller that doesn’t let me do the ftp from dell to update. I was following the instructions to download the 8gb file and make a bootable, this does all the updates stand alone as you select them, but if the bios is oem, wasn’t sure if it will work. So I may do the bios first, So I have some options now after reading this great post. Thanks. What kind of power consumption are you hitting with your electrical bill? I want to setup some VMware stuff, but worried about power draw and running bill up. plus heat.